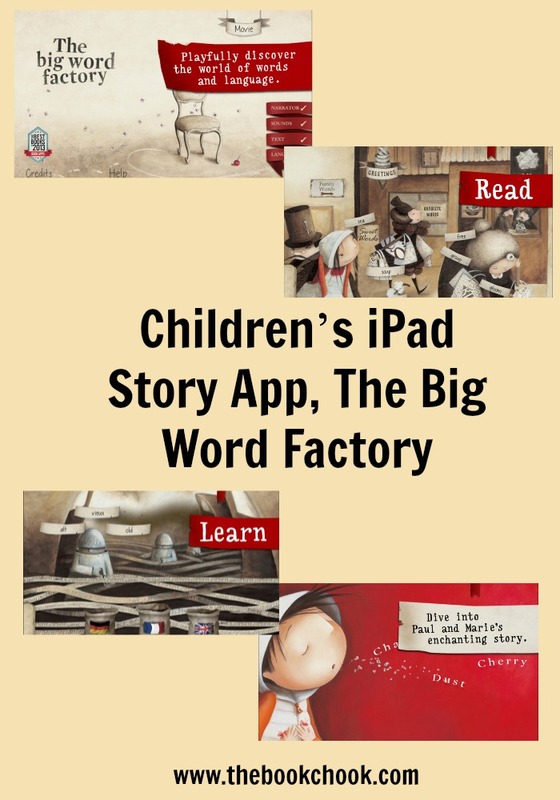 The Big Word Factory is a delightful and multi-featured story app,available in iOS and Android, and based on a book by Agnès de Lestrade and Valeria Docampo. There are occasions in life where we just don’t have the words - perhaps to express our feelings of love, of anger or of sympathy. In the world of The Big Word Factory, it’s even harder to have the right words. Because words are not free. They are made in a factory and usually only rich people can afford the really good words, swallow them and use them. Some lesser words can be found - in rubbish bags, or blowing on the wind - but this is rare. One day, Paul does find three words: cherry, dust and chair. He wants to give them to Marie, and hopes she will thereby understand his love for her. Could that be possible, with just three words? I loved this story, in fact, the whole app. The limited palette illustrations are beautiful, the text is almost enigmatic and the interactivity adds another dimension without detracting from the story itself. This has an otherworldly quality, much like a fairy tale. How clever of the developers to build in activities that focus on playing with words and the fun that can be! For instance, kids can experiment with sorting words, putting syllables together to make whole words, or listening to and reading silly words, obsolete words, even bad words (like dog poo!) I really appreciated too that the animation is gentle, definitely in keeping with the story. What fun to share this app with kids and imagine what our lives would be like without words! Perhaps miming for ten minutes might help children understand. Or they could be given a choice of only three words to use for a conversation with a friend. Another follow-up activity might be to have children contribute to a word list, and then assign each a given number of words randomly. Can they perhaps co-operate with others and form a sentence? What are their favourite words? What words would they best like to receive as a gift? Are there any people who do live without words? Check out my iPad App Reviews on Pinterest, and find more apps and articles via my Listly page. I’ll be adding The Big Word Factory to my List: Charming Children’s Story Apps.